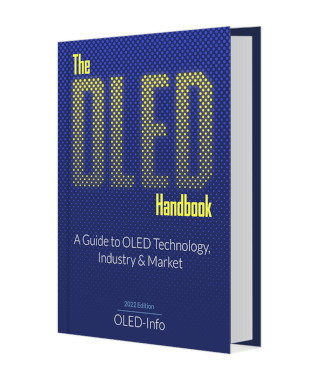 We are happy to announce the eighth edition of The OLED Handbook, the most comprehensive resource on OLED technology, industry and market - now updated for 2018. The OLED industry grows and changes very fast, and the new edition include new details on the OLED mobile display market, new production fabs in China, OLED TVs, flexible OLEDs and more. The OLED Handbook 2018 single-user edition can be downloaded now for $97 USD (via Paypal or credit card). To secure your copy simply click here. The Enterprise edition costs $600. Existing digital-copy customers are entitled to a 50% discount (and if you bought in 2018, you'll get the upgrade for free). If you did not receive your upgrade coupon, contact us to get one. The hardcopy printed version costs $149.99 and can be ordered through our publisher. If you buy by the end of the day (15/3) you can enjoy a 15% discount by applying the coupon FIFTEEN when you checkout.